If you are looking SSC Stenographer Notification, then here is the latest information available for you. Staff Selection Commission has recently released notification for recruitment of various Group C & D Stenographer Vacancy. The online application form of SSC Stenographer Recruitment 2018 is available from 22nd October 2018. 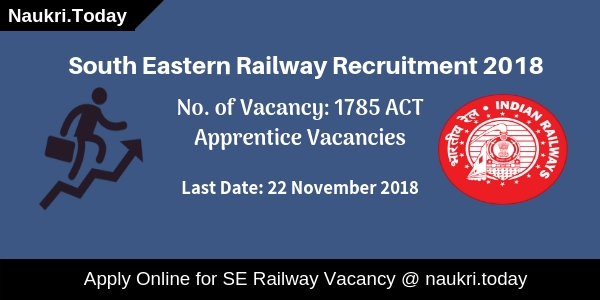 Applicants can submit their application form till on 19th November 2018. Applicants can submit their SSC Steno Online Form either here or official site ssc.nic.in. The online link is activated now and available till the last date. Rest information, you can collect from below paragraphs. SSC is inviting online application form for filling up Group C & D Stenographer Vacancy. Applicants those fulfill eligibility conditions may apply for SSC Stenographer 2018 Vacancy through online mode. There will be written test & skill test organize to select the candidates. Applicants can fill SSC Stenographer Vacancy 2018 Online form till the last date. Furthermore, for SSC Stenographer Jobs like eligibility criteria, application fees, selection process and How to Apply for Stenographer Post is mention below. Latest Update as on 21.11.2018: Participants may informed that Stenographer examination will he held on 05.02.2019 to 07.02.2019. Candidates should check given below article for further more details. Latest Update as on 21.11.2018: Applicants those have filled SSC Stenographer Online Form can submit their application fees on 21.11.2018 to 26.11.2018. Submission online application fees last date is 21.11.2018. While offlime payment make through challan last date is 26.11.2018. Latest Update as on 13.11.2018: Dear Applicants, SSC Stenographer Recruitment Notification has been published for filling up Group C & D Vacancy. 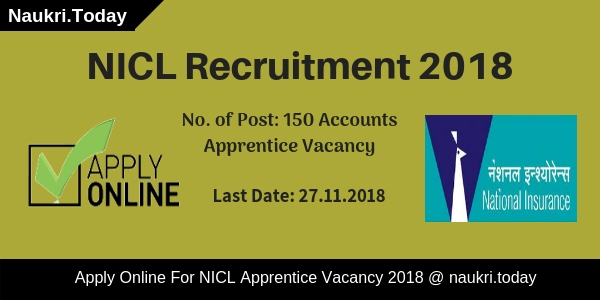 Those candidates are interested and fulfill eligibility conditions as well may fill the online application form from here. SSC Stenographer Notification PDF download direct link also available at the end of the article. So fill here online form of Stenographer Group C & D Vacancy and Simultansouly download notification also. What is the Selection Criteria of SSC Stenographer Vacancy 2018? Aspirants who want to apply for SSC Stenographer Vacancy 2018 may apply through online mode only. It includes details of education qualification, age limit, and other parameters. Applicant must fulfill eligibility criteria if they are going to apply for SSC Stenographer Notification 2018. Applicant must qualify 12th or equivalent qualification from the recognized board for SSC Stenographer Vacancy 2018. Other details refer to SSC Stenographer Recruitment Notification 2018. 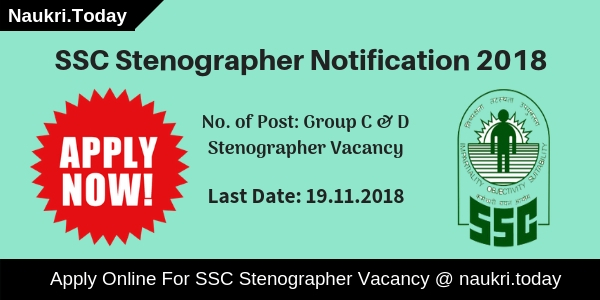 SSC Stenographer Grade C Vacancy: Applicant should be complete minimum 18 years. The maximum age is required for SSC Stenographer Notification 2018 is 30 years as on 01.01.2019. SSC Stenographer Group D Recruitment: Candidates should be equivalent or more than 18 years. You should be not more than 27 years as on 01.01.2019. Upper age relaxation for SSC Stenographer Jobs 2018 is available as per Govt. norms. Applicants those are belonging to General & OBC Male category have to pay Rs. 100/- towards SSC Stenographer Notification 2018. Fees can pay using SBI Challan Form/ SBI Net Banking or using Credit card/debit card. For more details refer SSC Stenographer Recruitment Notification 2018. After selection of candidates, they will also receive an attractive salary. The salary structure of SSC Stenographer 2018 Recruitment for Group C & D post will get made by the department as per Govt. pay matrix. Furthermore information you can check SSC Stenographer Notification 2018. Applicants selection will get made on the basis of online examination and skill test. First, those candidates submit their SSC Stenographer Online Form successfully then they are eligible to participate in CBT. There are total 200 questions and having equal marks too. Applicants must qualify SSC Stenographer Recruitment Exam to select the post. The online examination will organize on 01.02.2019 to 06.02.2019. Subjects are General Intelligence & Reasoning, General Awareness & English Language and Comprehension. Duration of examination will be 120 minutes. There will be 0.25 deducted as a penalty of the wrong answer. After qualified online SSC Stenographer Exam 2018, applicants will call for Skill test. The skill test is organized in both Hindi & English Language. Furthermore, details check SSC Stenographer Exam Syllabus 2018. If you are qualified both rounds then you will call for document verification and vice versa. For more information check SSC Stenographer Notification. Interested candidates those are eligible also for SSC Steno Jobs 2018 may apply through online mode only. The online application form is available from 22.10.2018 to 13.11.2018. For successful registration, candidates must fill all information correctly. Now follow some given below instructions to apply online for SSC Stenographer Jobs 2018. Download SSC Stenographer Notification 2018. Now first registered your personal information. Enter your Personal information, Mobile No. & Email Id. Submit your information and get your unique registration id & password on your email id and Password. Now go to Apply Online for SSC Stenographer Recruitment 2018 for part II registration. Enter other remaining information like educational and others. Make Payment of application fees through the online or offline post. Recheck Full Information of your SSC Stenographer Vacancy Application Form. Now submit your SSC Stenographer Job Online Form. Conclusion: Staff Selection Commission has released an advertisement for filling up Group C & D Stenographer Vacancy. Candidates those want to apply and eligible also for SSC Stenographer Notification 2018 may apply through online mode from 22.10.2018. The last date of submission SSC Stenographer Online Form is 20.11.2018.